I have read all of Paige Toon’s books and loved every one of them. I have been eagerly awaiting the release of One Perfect Summer and when I went into my local bookstore and see it was the last copy so it looks like I wasn’t the only one eager for this book to come out! This is my favourite cover of Paige Toon’s books, it is quite simplistic and yet still eye-catching and instantly recognisable as one of Paige Toons. Alice is taking a break in Dorset for the Summer with her mum before she goes off to university. The last thing Alice expects is to fall in love in her six week break but her heart is taken the moment she meets Joe in the local Devon pub. Their relationship grows over the six weeks but a tornado of events happen which see’s the couple ripped apart and Alice is heartbroken as her holiday is cut short, she wonders if she will ever find Joe again. Nursing her broken heart with the help of new friend Jessie, Alice begins to pick up the pieces of her broken heart and starts to build a life attending university and it’s not long before a new love interest tries to win her heart but will Alice be able to put her thoughts and feelings for Joe aside and start her new life with Lucas? This book had my full attention from the first chapter, there is something about Paige Toons writing style that draws you in from the moment we meet her characters. Alice was easy to warm to she is a very gentle and loveable character and she leaves a lasting impression even after the book finishes and I think this is because when we first meet Alice she is only 18 and experiencing her first serious relationship which we can all relate to. The book then jumps through the years of her life and we see her growing up. I loved Joe’s character too. His circumstances when we are introduced to him make his character feel vulnerable and we instantly want to care for him and hope that there are positive changes coming soon for him. When Alice and Joe parted I really missed his character, I was hoping we would move to Joe’s story at some point early on in the book so we could see what he was doing at the same time as Alice but none the less I still enjoyed the book I think it probably kept you turning the pages with the suspense of needing to know what happens to him. I really didn’t warm to Lucas and I struggled to see what Alice saw in him he was very controlling and he seemed to just be competing with his ex rather than taking Alice’s feelings into account. I would say this is one of my favourite Paige Toon boos but I would love to shake this author! She really does like to leave the reader hanging. 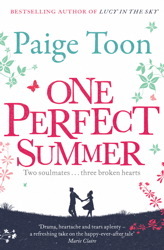 As it was coming to the end I couldn’t wait to see how thing panned out but no wait for it....... there is to be a sequel to One Perfect Summer, Paige Toon what are you doing to me how will I sleep tonight! This is a great read which will have you speeding through the pages and sitting on the edge of your seat. A must read by Paige Toon. Ahhhhhh!!! Exactly it's so not fair the way we are left hanging!! :( I could have kept reading for ages!